Current annual subscription is $47.50 if joining between 1st December 2018 and 31st May 2019. Once formally approved, your membership will be current until 30 June 2019. Events are free to members and substantial discounts are offered to members for workshops offered by VADR and sometimes for workshops and courses offered by other organisations. Invitations to practice forums and professional development sessions arranged by the VADR committee at no charge or a nominal fee. Many of these are open to the public. Information on available courses- from half day to PhD- run by community groups, commercial organisations and universities. Negotiating special member rates for a variety of courses. We are not affiliated with specific commercial organisations or training providers so are able to make arrangements with a variety of organisations. Opportunities to meet other members and key people in the ADR field by arranging events with speakers from ADR service providers, academics and practitioners. Active representation and liaison, through the committee, with other ADR organisations, academic institutions and state and federal governments to ensure that VADR members are included and kept informed of broader issues. 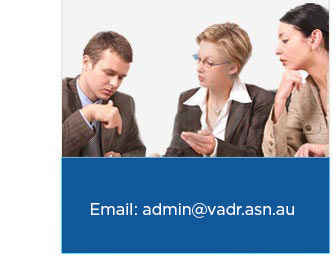 VADR members are engaged in ADR in a variety of ways on a full time, part time or occasional basis. Many use one or more ADR processes and techniques. Some have primary occupations in other fields where they use ADR. Our members include: professional, full time mediators, dispute resolvers for complaints schemes and ombudsmen, sessional mediators on Government panels, occasional mediators for community mediation programs, professionals and HR managers who negotiate, facilitate in their own workplace, humanitarian workers dealing with intercultural disputes, teachers, financial counsellors who negotiate for their clients, industry negotiators, academics, researchers, town planners, valuers, local government staff. They are brought together by a common interest in learning more about ethical, respectful, methods of dispute resolution.